Increasingly, Chief Marketing Officers (CMOs) are being held accountable for revenue performance. But most marketers still lack the technology tools and repeatable processes that would enable them to play a more direct role in driving revenue. And 70% of revenue growth initiatives sink because of an ongoing disconnect between marketing and sales. 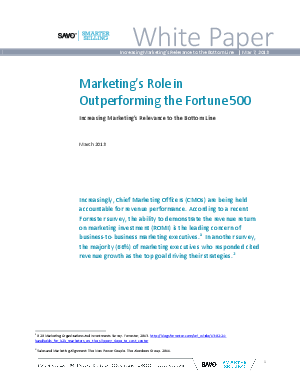 This white paper takes a look at what top revenue performing companies are doing differently than the rest in terms of measuring revenue performance and aligning sales and marketing teams.